"Not a lot, really. I still have an old, unautomated console that I got in the late '80s. And I still do a lot of work on an old, reel-to-reel digital machine. I just love the VSO. [laughs] Not that you can't do that in Pro Tools - you certainly can. I do have Pro Tools, but they seem to come later in the process. So besides the obvious - that they're a great band - what is it that you like about the Stones so much? [laughs] "That's an odd question! Hmmm, well, that's sort of an odd thing for Stevie to say, too. I guess she was just looking at bands she likes. The Stones…uh, sure! [laughs] What a great situation. They have a raw, primitive approach to music, and I relate to that - I'm kind of a refined primitive myself, having never been taught music. 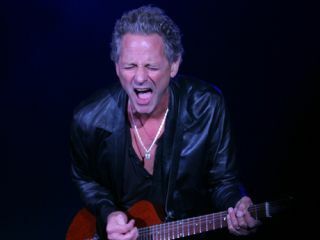 You first demonstrated your fingerpicking technique on your initial albums with Fleetwood Mac. It's really developed over the years, into a rolling style - like a waterfall of notes. The title track, Seeds We Sow, is a fingerpicking extravaganza! "I think that when you're quite young, you tend to be part of a community of people who are aspiring to something similar as yourself, or they share the same sensibilities, and because of that you have conversations and exchange ideas - that's where the inspiration comes from. "Some of these acts have broken through: Arcade Fire, Phoenix, Dirty Projectors, Vampire Weekend - there's a lot of groups out there that are making really good, smart music. It's about the spirit behind it all."